Try to look up information on this little-known AM Country station and you’ll only find the religious incarnation of WKMB. Apparently falling out of existance shortly before the internet came into being in the early 90s, this wonderful little recording of Stirling, New Jersey’s AM 1070 chronicles what might be the only piece of this station’s former Country format. Island. As of (this writing), there is still no Country Music Station in New York. Responding a bit late but wow – great to see something about this station. I did a sunday 12 to 6 stint for a few months in 1999. Had to stop as I was commuting out from Queens. Herb was very good to work for, an old time radio enthusiast and there was BOXes of country records in the small studio located i think with doctor’s offices. Despite that we did do a 1 2 3 format where it was 1 Top 20 hit. 2 Something ‘From the 90s’ (current then) and 3 ANYTHING DJ WANTED. Also, WKMB, like virtually all the radio stations in the suburbs (of New York City, at least), was established in the late forties-to-early fifties or later (in WKMB’S case, ’72) to serve a burgeoning population in newly suburbanized areas (and areas that had been suburban from time immemorial). Either when ‘KMB first hit the airwaves or shortly thereafter, its format was top 40 and/or pop adult (the pop rock format now known as adult contemporary) WKMB remained as such until 1979 or the early part of 1980, when it went to the country format heard on this aircheck. One of the blessings of listening to Stirling Country was, like Bruce said, they could play anything the DJ wanted to play. So we became familiar with songs like Come On Home by Tony Arata. I met Tony at The Bluebird in Nashville and asked about that song. His exact words; “You’ve heard Come On Home?” The WKMB format really spoiled me for listening to other country stations. I still believe they were “The best little country music station…” anywhere. It was sung by a guy that sounded like a cross between Moe Bandy and Charlie Pride but he was not as well known as either of them. I believe it was recorded live. Any leads would be appreciated. I perform live and think this song needs to be heard again. I got to thinking about WKMB today and was pleasantly surprised to find this air check. I was actually the first voice on WKMB in 72. I had been working with Herb Michaels to set up the station equipment, and actually was able to be the one to sign on for the first time. I had had a broadcasting career in Columbus, OH and ended up working for Bell Laboratories in NJ, and met with Herb the night he presented the proposal for the station to the town council. I stayed with the station for several years, doing news in the morning, and DJ on the weekends while still working for the Labs. I ended up leaving the station just before they switched to the country format. What a great memory I’ve had today! WKMB was a wonderful station to listen to and great place to work. I started working there right before Herb passed away, he was a nice man and a real straight shooter. I started working Sunday mornings when Herb fired a gentleman named Rocko an hour before his shift was over and threw me right into the fire, having never worked any of that equipment before….it was an interesting way to start to say the least. Herbs son Bill took over the station and being a DJ there was a lot of fun. Often, I was in the building by myself, so when the door opened and the mail had already been delivered, I never knew who was coming through the door. We had to play the top 20, but we were able to play what ever else we wanted. I had a 6 hour shift and it always went quick. I enjoyed telling short stories about my family and friends during my show and it was very cool being able to play real records and not just CD’s. The people I worked with at the station were terrific and I always enjoyed talking with the listeners. Although I was only there for about a year, it was one of the highlights of my life and I’ll always be thankful to Herb for hiring me. 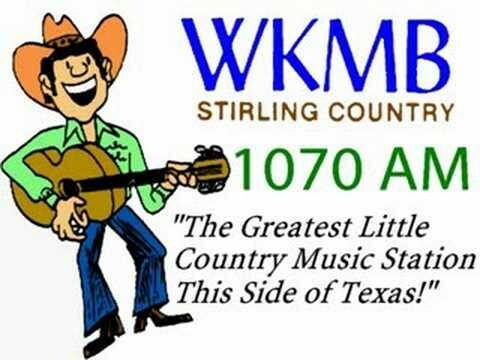 WKMB Stirling Country was a special station and there is nothing like it today. I’m blessed to have been a part of it.